Papua New Guinea SP PNG Hunters head coach Michael Marum's three-year contract with the Hunters will expire at the end of this year but he says he is happy to stay with Hunters and will continue to support them. He said it was tough but had a successful two seasons in the Queensland Cup – just missing out on the top five in 2014 and then finishing second last season but losing two finals matches. “This is final season on my contract and there are new challenges like getting the eight new faces used to the intensity and level of the Q-Cup. The 42-year-old recently completed a one-week stint with the Brisbane Broncos and spent time with coach Wayne Bennett and his staff learning from the NRL set up. “From the Broncos expereince I learned that having a professional attitude and mindset was the difference between performing well consistently and not reaching your goals,” Marum said. The expereince enabled him to have a clear picture of what he wanted to achieve in his third season as coach. 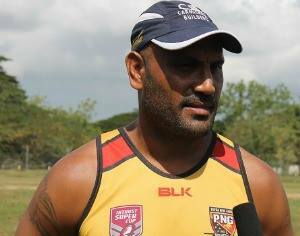 Marum won the Q-Cup coach of the year award last season and is apparently on course to become the next Kumul coach but even a position like that has not taken his eyes off the prize which is to win a Q-Cup title and continue developing PNG talent. During the South Pacific Brewery sponsorship yesterday, SP CEO Stan Joyce praised Marum for his outstanding leadership and quality coaching with the PNG franchise in Q-Cup. Marum was frank in his desire to continue with the Hunters at the risk of turning down the Kumuls coaching position even if it was offered to him.